More Dragon Quest information coming out of PAX. Man, Siliconera must have grilled Dragon Quest Executive Producer Yuu Miyake and Mobile Producer Noriyoshi Fujimoto to get this much information. Today’s comments revolve around yet another game that hasn’t been localized in the West, the MMORPG Dragon Quest X. Unlike the Dragon Quest VII 3DS remake and Rocket Slime 3, which would merely require a traditional translation, fans have generally accepted that Dragon Quest X would never be localized because running a worldwide MMORPG is a far more serious proposal. Miyake and Fujimoto more or less confirms their fears, even though they claim they would love to do it. The general focus of Dragon Quest always has been and always will be in Japan. Americans are just simply lucky enough to be along for the ride. Dragon Quest X would require an absurd amount of subscribers to justify servers, pricing plans, and even a localization into English. Of course, I would love to see it in America as much as Miyake and Fujimoto would love to distribute it, but I would rather focus on the games we have a legitimate chance of getting, like Dragon Quest VII and Rocket Slime 3. It’s a long shot, but if Dragon Quest X were to come to America, I think it would only be available for PC and mobile units. The Wii U doesn’t have the audience, and the Nintendo 3DS is played differently in crowded,Wi-Fi enabled Japan than it is in the disconnected United States. Dragon Quest X is also the first game to be developed in-house at Square Enix, with other games in the past being developed by Chunsoft, Heart Beat, ArtePiazza, and of course, Level-5. Miyake explains the reasoning behind Square Enix wanting to tackle this one. Makes sense. No doubt Dragon Quest XI, believed to be a more traditional single player game, is under development at an outside studio with longtime creator Yuji Horii overseeing it. However, yes, Final Fantasy XI and Final Fantasy XIV‘s success clearly puts Square Enix as one of the few Japanese studios to successfully make an MMORPG. 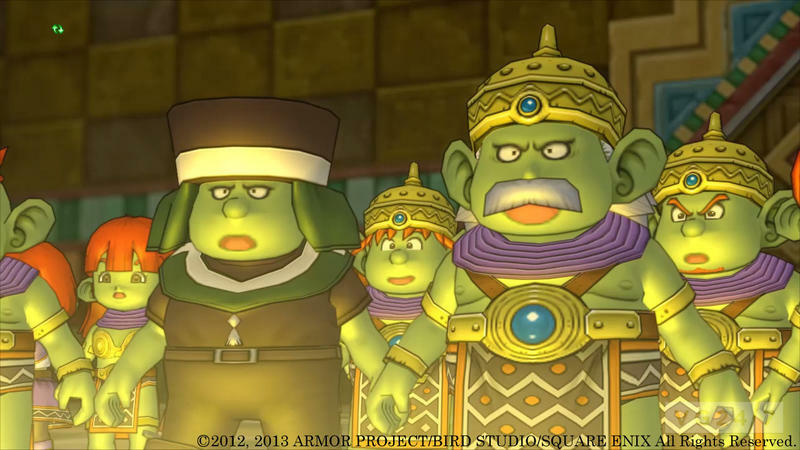 Plenty of other great news from Dragon Quest this week also. The first three games are being ported to smartphones, hopefully with other traditional gaming platforms in mind as well, and Sony also revealed a Dynasty Warriors brand of action game with Dragon Quest: Heroes.